After the Arizona Coyotes relieved Don Maloney of his general manager duties in April, all eyes were squarely focused on who his replacement would be. 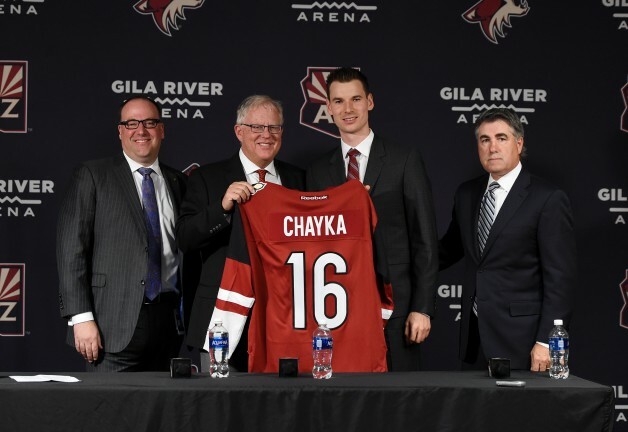 The Coyotes stayed in house and on May 5, tabbed 26-year-old John Chayka to lead the rebuilding process in the desert. He turns 27 on June 9. With the hire, Chayka is now the youngest GM in NHL history. He’s the eighth GM in franchise history. Chayka joined the Coyotes last season as assistant GM/analytics. He was involved in all areas of hockey operations including NHL, minor league and amateur player evaluation, as well as player development and coaching support. Prior to joining the Coyotes, Chayka co-founded and served as the director of hockey operations at Stathletes Inc. since 2009. Stathletes is a hockey analytics firm that tracks data through an intensive video analysis process and breaks down the game to provide objective insight into player and team performance tendencies. Tippett also agreed to a new five-year contract. Under the new structure, Drummond will oversee the Coyotes’ hockey operations department and Tippett will be involved in hockey personnel decisions. Drummond’s main role will be to ensure communication and collaboration within the department and serve as a catalyst for ensuring an alignment of vision and objectives between ownership, management, coaches and the team’s core players. Drummond was beyond ecstatic about moving Chayka into his new role. A native of Jordan Station, Ont., Chayka earned his bachelor’s degree in business administration from the Richard Ivey School of Business at the University of Western Ontario in 2014. He was drafted to the Ontario Hockey League in 2005 by the Plymouth Whalers (now Flint Firebirds), but committed to going to college instead. He played Junior A hockey in Canada and was a top scorer in the Maritime Junior Hockey League and also played briefly in the British Columbia Hockey League before suffering a career-ending injury and turning to another side of hockey. Now hitting the ground running with the Coyotes, Chayka has a full plate right off the bat. Seven players from the season-ending roster, including longtime captain Shane Doan, are unrestricted free agents come July 1 and nine players will become restricted free agents. Chayka wants to meet with Doan as soon as possible to gauge the 39-year-old’s future and to pin down strategy for this month’s NHL Draft in Buffalo, N.Y., where the team picks seventh in the first round. “I want to get together with him and really see where he’s at physically and we’re he’s at for next year,” Chayka told ArizonaCoyotes.com. “We’d be thrilled to have him on the ice. But also I want to get his perspective on things. He’s been around for a long time with a lot of successful teams and he’s been around for a lot of teams that haven’t been good enough.